In July, Johnson and Johnson Vision Care will launch its' first ever monthly disposable contact lens, Acuvue Vita. For years Acuvue has enjoyed great brand recognition for providing comfortable contact lenses, but their benefits have been limited to 2 week and daily disposable contact lens wearers. Roughly 40% of all contact lens wearers in the USA wear monthly disposable lenses, an arena where until now Acuvue has never had a lens to offer. 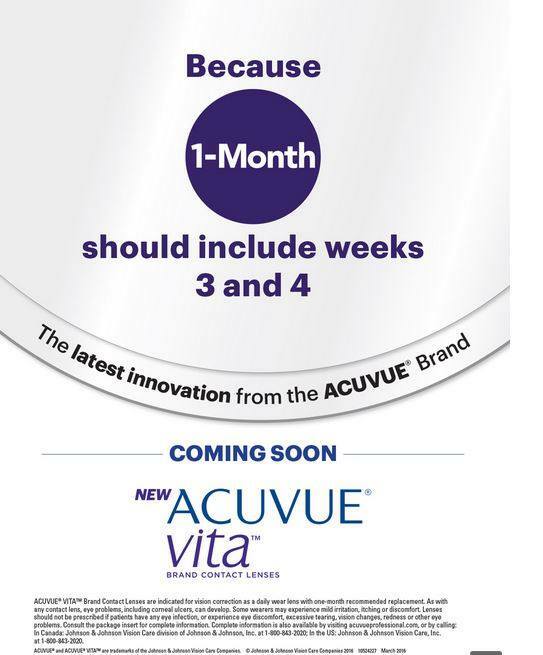 But with so many monthly contact lenses on the market, many wonder how will Acuvue Vita differentiate itself? Acuvue Vita is made from a brand new silicone hydrogel material called senofilcon C. Compared to Acuvue Oasys, the company's popular 2 week disposable lens, Acuvue Vita contains 30% more polyvinyl pyrrolidone (PVP). How does a contact lens stay hydrated and comfortable all day long? That's the job of PVP. This molecule binds to both the lipid layer of our tear film (top coating) and the aqueous (water or middle portion) to help the contact lens integrate into our normal tear film matrix. 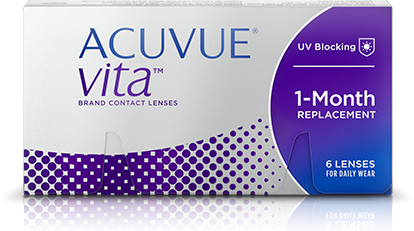 Many other monthly contact lenses are designed with coatings to block tear film lipids from adhering to the surface of the eye; Acuvue Vita doesn't block lipids, but instead integrates the lipid tear film layer into the lens itself so that it doesn't build up on the surface. That means less friction as your eyelid blinks over top of the contact lens, better vision as your contact lens stays clean of debris and build-up, and more comfort for you because the lens feels less like something in your eye and more like a layer of your own natural tear film. According to internal research done by Johnson and Johnson Vision Care, 50% of monthly contact lens wearers experience discomfort with their contact lenses before the end of the month. 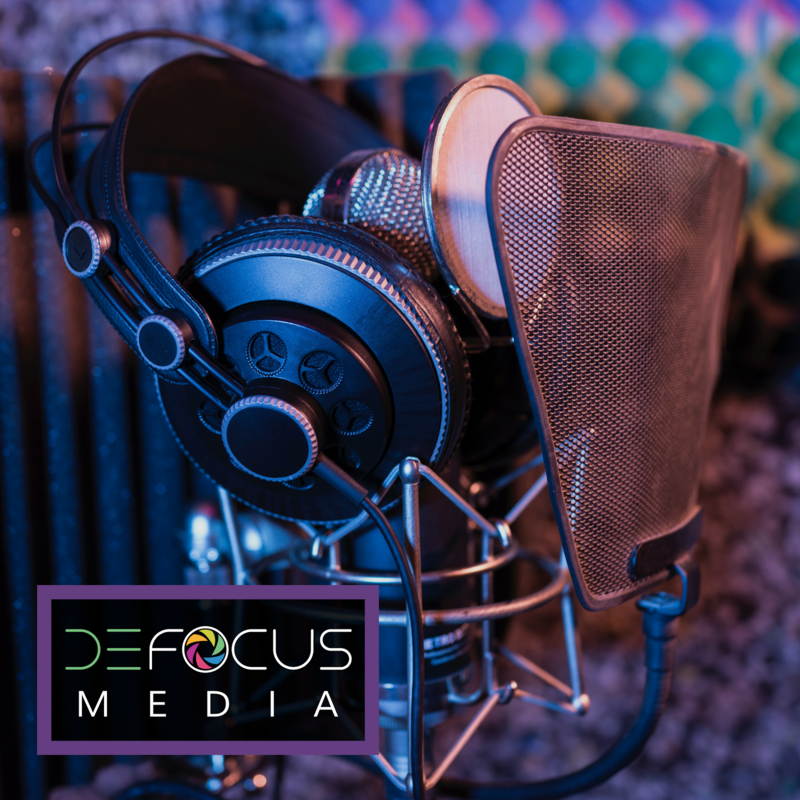 Their goal with Acuvue Vita is to introduce a lens that is initially comfortable, and doesn't deteriorate as quickly through week 3 and 4 as other lenses currently on the market. Who is the ideal candidate for this lens? Acuvue Vita is designed to compete with other monthly lenses on the market, so if you wear monthly lenses and aren't happy with the comfort you are getting, this lens may help. If you are a happy 2 week or daily disposable contact lens wearer, this lens is probably not for you. A fresh lens every 2 weeks, or even better, every single day is always going to out perform disposing a contact lens just once a month. Do you sleep in your contact lenses? Acuvue Vita is not approved for overnight wear and Johsnson and Johnson has no plan to submit to the FDA for this approval. This lens is made to be taken out and cleaned every night. If you want an overnight wear lens, the only Acuvue family lens currently approved for sleeping in is Acuvue Oasys with a 1 week disposal frequency. Have you tried Vita yet? I'd love to hear your opinions below! sounds great but have to wait until Asia Pacific catch up ! We have none here at the moment but stand corrected. I've been wearing it for about a week now, and will start fitting patients with it on Tuesday. First monthly wear lens since my lasik surgery 15 years ago that is both comfortable and does not fluxuate in VA. I am curious to see how it does at the end of 4 weeks. We are also testing one with MPS solution and one with H2O2 solution too. Pretty excited with initial results. Wow so exciting! I just unboxed my fitting set and I'm eager to see what my patients think. I've read a lot of great comments on ODs on Facebook about the initial patient response. I'm on day 5 of my trial pair. I don't feel them, but they're a bit dry and I've had to use drops a few times. I can't imagine them lasting a month. Vision is ok but I am also testing out a couple different strengths for monovision (not quite ready for or wanting multifocals). 2 days later...my eyes are red and irritated. Not wearing them anymore! Lasted two days with me also before both eyes were SUPER red! I've been wearing Proclears for years and my doctor suggested I try the Acuview Vita. First thing I noticed was the close vision lens (I wear monovision) was not as good as as my Proclear, even at the same prescription. I needed cheaters for basic reading, which I did not need with the Proclear. Will mention this to my Dr.
Just started wearing and I find by the end of the day my eyes seem to be slightly irritated and more dry than usual. I will keep at it for a few more days, if this continues to be the norm will look elsewhere for contact needs. I have been using the Acuvue Vita for 2 months. These lens are inferior and wear out prematurely. They usually only make it to about 2 weeks. I would avoid these lens until they correct the problem. I take my lenses out every day and clean them. I have never had this kind of a problem before with a monthly lens of other brands. I don't like these lenses a they dry out early in the day. They also get dirty and hold on to debris causing me to have to remove them to clean them throughout the day. I've been wearing a trial pair for a few days now and really liked them at first. However, I'm now finding that, after about 10 hours of wear, they're so dry that they're stuck to my eyes and very hard to get out. It's looking like I'll have to try another lens. Mimi, I have just been given a trial pair, haven't put them in yet, but saw on the Acuvue site that you can get a refund for up to 2 boxes, if they don't suit you. Ask about this where you purchased. Really glad to find your blog and the comments, I've given the Vitas a full two weeks and just went back to my eye doctor today for another option. I experience a sense of pressure in my eyes with the Vitas in, dryness, general sensitivity. My dr suggested I try these bc I have 'steep' eyes (shape) and my air optix weren't fitting the surface as well any more.